Morgantown, W.Va., (February 2019) – NextGen Federal Systems (NextGen), an innovative information technology small business, was awarded a Small Business Innovation Research (SBIR) Phase II contract by the US Army. Under this new Phase II contract, NextGen will expand development of the Autonomous Environmental Routing Onboard (AERO) system to enable swarming drones to operate autonomously in diverse and changing environments. AERO’s unique solution includes artificial intelligence and machine learning techniques, and also integrates with the Army Research Laboratory’s Automated Impacts Routing (AIR) software to optimize the drones’ navigation based on environmental and weather conditions. 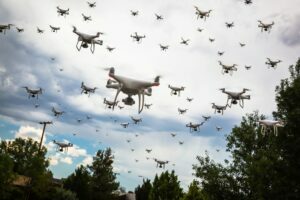 AERO can share this environmental intelligence between a swarm of drones to collectively improve their operational picture and mission success rates. The US Army has multiple initiatives to utilize swarming drones as part of the tactical mission command capabilities that will benefit from the AERO system. “As the proliferation of small, autonomous drone operations continues across the Department of Defense and commercial markets, AERO’s ability to optimize the mission based on current and future environmental impacts becomes an even more critical component for mission success and safety,” said Eric Babyak, Principal Investigator for NextGen. “Our team is eager to continue to mature our solution to prepare for operational applications.” The system is comprised of a modular framework centered around a companion computer installed onboard drones. The companion computer interfaces with onboard environmental sensors, tactical communications, and existing autopilot systems. Leveraging this data, AERO will communicate with other drones in the swarm, ground stations, and airborne networks to generate high-resolution environmental models to improve drones’ autopilot navigation. NextGen’s AERO system will also provide drone swarms with the ability to leverage favorable environmental conditions, expanding flight time while also improving onboard sensor performance and enhancing mission capabilities. AERO will address additional defense and Government needs for autonomy and extend market penetration to commercial industry for corporations investing in drone swarms. “AERO provides important functionality to future drones, allowing drone swarms to measure and model their environment to make critical decisions that improve mission success without need for human-in-the-loop,” said Babyak.